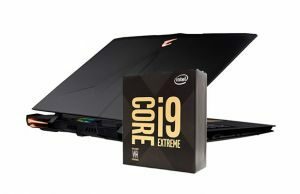 Skylake is Intel’s most recent hardware platform at the time of this post and it’s going to be driving latest-gen portable laptops, 2-in-1s and miniPCs (other types of computers as well, but we focus on mobile devices on this site) for roughly the next 12-months. All the PC makers are going to jump in bed with Skylake, that’s why this update will have a significant impact on the devices you’re going to buy from now on till the second part of 2016. Skylake’s launch coincides with Microsoft launching Windows 10 and it will spur a series of new designs and SKUs that are going to include features we did not find on laptops in the past. Wireless charging is going to be one of them, improved WiDi, WiGig, RealSense, as well as unlocked laptop processors or the ubiquity of USB Type-C and Thunderbolt 3.1, among others. You might not find these on the first batch of Skylake ultraportables, but they are going to become a given in the years to come. We’ll talk more about all these down below. But first, let’s turn our attention on the technical side of Skylake. Skylake is the 6th Generation of Intel’s Core family. It spreads from lower-power 4.5W CPUs (Skylake Y, or Intel Core M), to 15 and 28 Wh series (Skylake-H, or Intel Core U) and the high-power 45Wh mobile processors in the Skylake-H line. 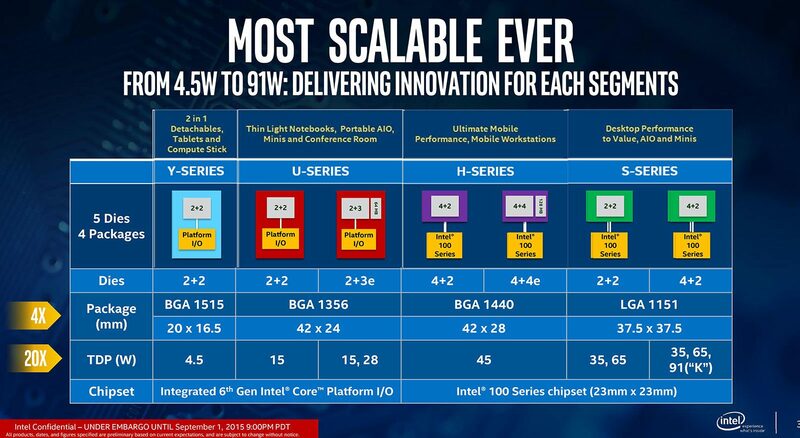 Intel’s platform also covers a wider gamut of processors, starting from the base-level Celeron and Pentium, continuing with the Core SKUs and up to Xeons. 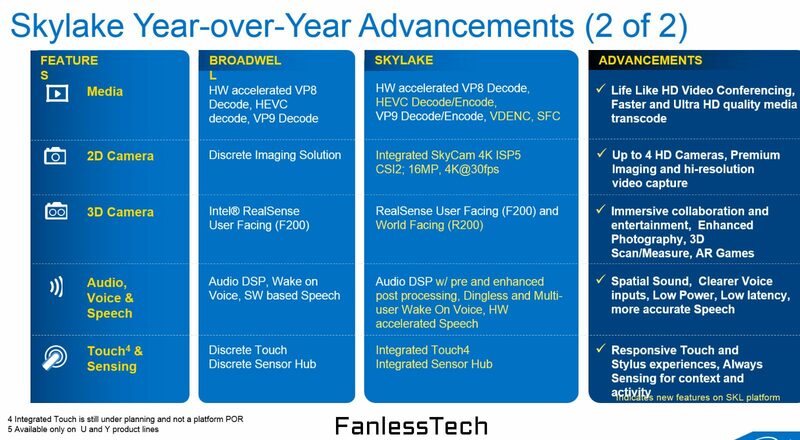 Here’s how Skylake compares to the previous Broadwell line (source). 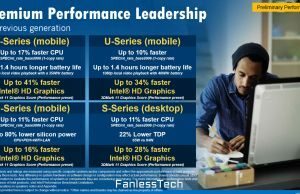 Intel brought forward the first generation of Core M hardware last year, with the launch of Broadwell, a fanless low-power design created for thin and light devices. It powered the Apple Macbook, Asus Zenbook UX305FA or the Lenovo Yoga 3 Pro, to name just some of the the better implementations. 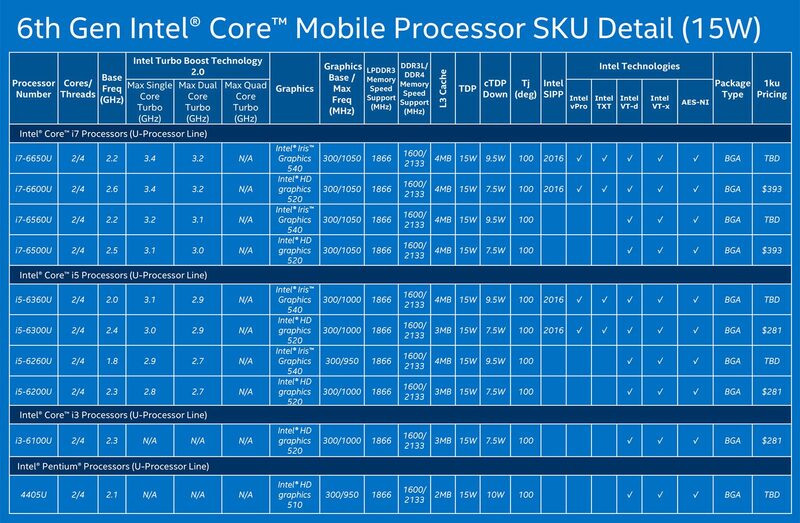 The Skylake Core M Skylake promises to be a major step up. CPU performance should be up by 15-20%, graphics performance should increase by up to 40%, while the platform is going to run more efficiently. 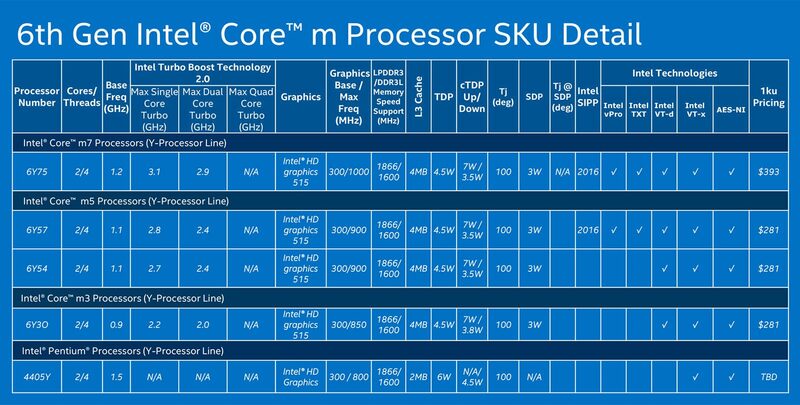 And since the package size of the Skylake Core M processors is significantly smaller than of its predecessor’s, I expect the new platform to run cooler as well, as temperatures have been an issue with the previous generation. Of course, while all these sounds great on paper, they need to be vetted on retail models, and we’ll do that in our future reviews. 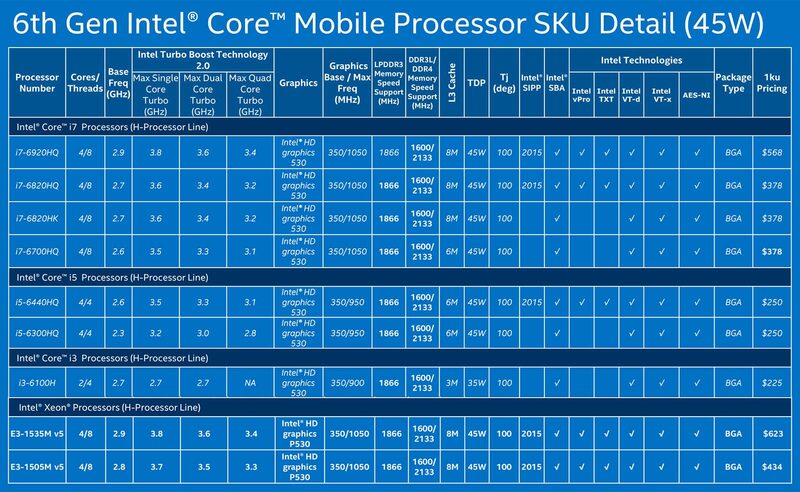 Intel slightly rebranded the Skylake Core M family, splitting it into Core m3, Core m5 and Core m7 subseries, with the latter being the more powerful of the three. This falls inline with the Core i3/i5/i7 branding they’ve been using for a while and should help users tell apart the Core M processors easier. Still, the three families are pretty much identical, aside for the base CPU/GPU clock speeds. They all support TurboBoost and HyperThreading, all include 4 MB of L3 cache and the same Intel HD 515 graphics (GT2 series graphics with 24 EUs). None offer DDRAM 4 support or eDDRAM graphics, unlike the Skylake-U lines. All the Core M families have a default TDP of 4.5W, but OEMs are allowed to tweak that in order to pick the optimum balance between performance and heat for their systems. The Core m5 and m7 chips can range between 3.5 and 7 W, while the Core m3 SKU can go between 3.8 W to 7W. Most 1sr gen Core M devices stuck with the default TDP, but I’ve seen what middling with the TDP can actually do in terms of performance in this review. So that’s something I hope more PC makers will explore with their Gen2 Core M products. 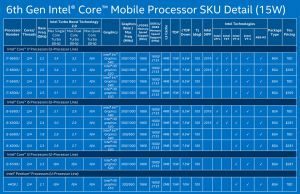 As a final note here, it’s worth noting that the Skylake Core M platform will support eMMC storage and integrate an Image Signal Processor, which means we should see a broader range of Core M devices in the year to come (and not just premium entries), including mainstream tablets, phones and computing sticks (in fact, Intel already announced a Core M compute stick). 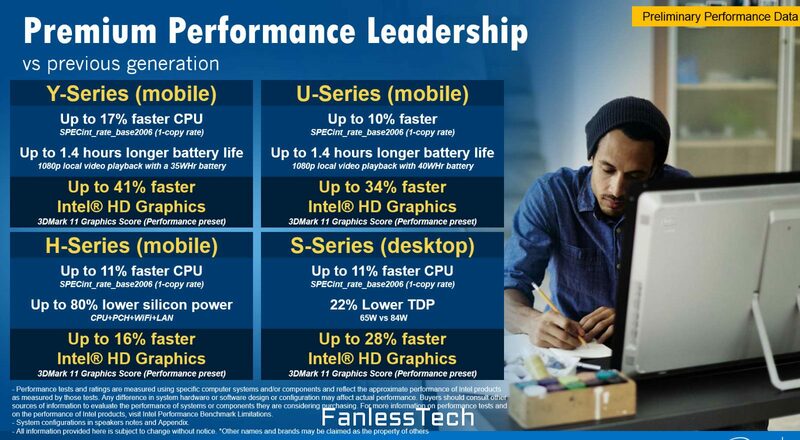 While Core M is designed for the thinnest forom factors and does sacrifice performance to some extent, the Skylake-U hardware is going to power the vast majority of ultraportables in the next year and carries on from the Broadwell-U and the wider spread Haswell-U devices. Most PC makers will update their popular lines to the new platform, so we’ll see Skylake versions of the Dell XPS 13 9343 or the HP Spectre X360, among others, although they might operate slight name changes to differentiate the newer models from the previous ones. Some will however launched completely revamped models, like the Lenovo Yoga 900 or the new Acer Aspire 14. This post gathers all the available Skylake ultra-portables in one place, so you might want to check it out. The Skylake-U series consists of either 15 or 28W Core i3, i5 and i7 processors. Based on past experience, the 15W CPUs will make their way into the majority of ultraportables, while the 28W lines will only be part of some of the premium options, like the Macbook Airs/Pros and a few Windows machines. Aside from the clock-speed difference between the two lines, the 28W processors will include significantly faster GPUs than their 15W counterparts. In fact, the new GPUs architecture is probably the most interesting part of the Skylake-U series, although the support for DDRAM 4 up to 2133 MHz, LPDDR3 and DDR3L running at a maximum speed of 1866MHz, or PCIE 3.0 Express lines will have an impact as well. And that’s because Skylake promises up to 10% increased CPU performance when compared to Broadwell, but up to 35% faster GPU performance. How is this achieved? In very few words: trough eDRAM. Now, you shouldn’t expect much gains from processors like the Core i5-6200U or Core i7-6500U over their Broadwell variants, since both pack GT2 graphics with 24EUs, but the Skylake variants are slightly higher clocked. The big gains are reserved for the Iris chips. 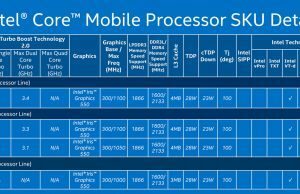 Some of the Skylake-U processors are going to include 64 MB (Iris chips – Intel HD 540) or 128 MB (Iris Pro chips – Intel HD 550) of eDRAM. This is basically a chuck of DRAM included into the CPU package, that acts as cache. It’s used by both the GPU and the CPU, as L4 cache, and that means it will have an impact in most use scenarios, not just in games or other graphics dependent applications. eDRAM has been a part of the Iris graphics on Haswell and Broadwell, but with Skylake it will make its way into a larger number of processors, thus into more retail computers. On top of that, Iris Pro remains reserved for the higher-end 45W SKUs, but Iris graphics will make it to 15W CPUs as well, not just to the 28W models. Here’s a quick look at the Intel graphics chips embedded with the Skylake processors. As a side note, it’s worth adding that the Iris and Iris Pro chips will only be available in the first quarter of 2016, while the vPro CPUs are going to be revealed in Q4 2015. The remaining chips are already shipping as of September 2015 and will make their way into products in the next weeks. Skylake-H consists of Core i3/i5/i7 and a few Xeon E2 processors for laptops, with a TDP of 45W (with the exception of the Core i3, which has a TDP of 35W, since it is the only dual-core processor among these, while all the others are quad-core CPUs). The Core i5s do not support HyperThreading, while the Core i3, i7 and the Xeons include HT as well. All chips support DDRAM 4 and bundle Intel HD 530 graphics, which is a GT2 chip with 24 EUs and no eDRAM. That’s not going to be a problem though, since these CPUs will be paired with dedicated graphics in the vast majority of the available final products. 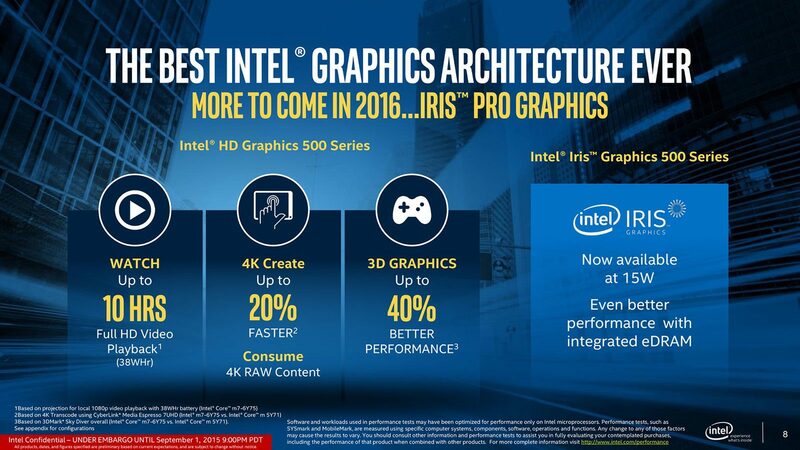 Still, higher end Iris Pro Skylake-H CPUs might be launched in 2016. The major difference between the high end Core i7 and Xeon E2 processors are the latter’s support for ECC memory. Otherwise, both lines support HT, vPro and have the same amount of L3 cache. The Core i7-6820HK processor is more special special, as it lacks vPro, but the K at the end means that it’s an unlocked CPU and can be easily overclocked (like the Intel K lines of desktop processors). That’s a first. The Skylake-H processors will make their way into the more powerful computers bound to be launched in the next months, from gaming machines to workstations and premium multimedia devices. Keep a close eye on our reviews, we’ll grab our hands on plenty of those in the future. 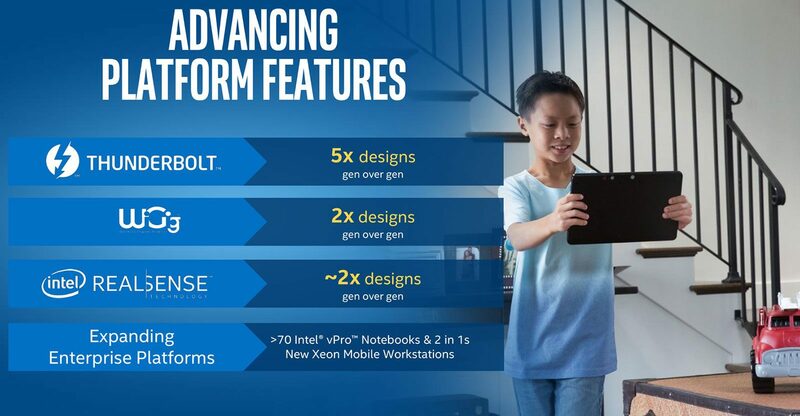 As I was mentioning in the beginning, Skylake is a hardware bump, but the Skylake laptops that will be launched in late 2015 and 2016 will pioneer some technologies that could make our lives with these computers a little easier. The “path to no wires” is especially interesting. Right now you need different cables if you want to connect your laptop to a TV or external monitor, if you want to download stuff from an external hard-drive and especially if you want to charge it. This is going to change. First of all, Skylake brings up a new generations of WiDi and WiGig. WiDi (Wireless Display) is a technology that allows you to wirelessly connect to compatible TVs and monitors and stream the content from your laptop/tablet onto those. As of 2015 it supports 4K 60Hz streaming. It also binds with Intel’s vPro to offer a secure and wireless way to connect to peripherals like projectors or whiteboards in corporate environments. WiGig (Wireless Gigabit Alliance) is a low-frequency low-range (up to 10 m) protocol that allows wireless high-speed connections between devices. It also works with Intel’s vPro technology to ensure safe connections. In other words, with WiGig enabled machines you can wirelessly connect to your external drive and copy files at Gigabit speeds (up to 7 Gbps) or you can easily connect to an external dock, without requiring a physical connection anymore. So basically WiGig enables cable-free high-speed peripheral connectivity. WiGig is significantly faster than WiDi, but has a shorter range. See this Wikipedia post for more info. Aside from these,Thunderbolt 3 is a part of Skylake laptops and it’s going to be a game changer. 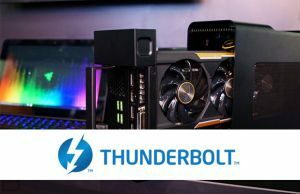 Not only does it allow transfer speeds of up to 40 Gbps, but it can also deliver up to 100 W for charging a laptop and drops the miniDP form-factor in favor of a reversible USB 3.1 Type-C connector. That means you’re only going to need a single kind of cable for most of your tasks. Intel expects 25+ devices to ship with Thunderbolt 3 by the end of 2015, and many more in 2016. In fact, I’m expecting USB C and Thunderbolt 3 to become ubiquitous in a few years and present on all sorts of devices, from phones to desktop, laptops or TVs. Follow this link for an updated list of Thunderbolt 3 compatible notebook. Last but definitely not least, wireless charging is coming to Skylake devices in the second half of 2016, but don’t throw your hats in the air just yet. 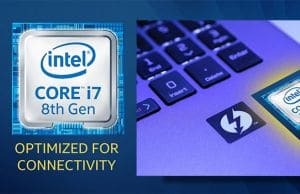 Intel are supporting a standard called “Razence”, backed up by the Alliance for Wireless Power (A4Wp), which includes members from multiple fields. This works fairly simple. You’ll have to buy a charging set, which can be drilled under a table or any surfaces of a certain width (up to 5 cm). This will create a charging field on top of those surfaces and any compatible devices placed on that spot will charge wirelessly through magnetic resonance (up to 20W). Intel claims wireless charging will be back-compatible with some of the existing devices through special cases, but I doubt that’s going to be very convenient. On the other hand, there are still plenty of questions unanswered when it comes to Razence and one would argue this is not necessarily the best way to wirelessly charge a device. Plus, this will be implemented on phones and other small devices at first and will only make its way to laptops later down the road. It will probably take a few more years, but in the end I’m confident wireless charging is going to become part of our lives. Just don’t expect to throw away your power plugs just yet. 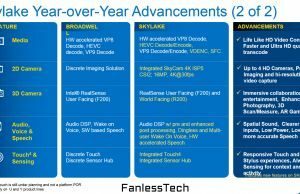 Aside from all these, LTE connectivity (fast wireless Internet) and RealSense 3D cameras (with security or gaming applications, among others) will make their way into a fair amount of Skylake laptops. Microsoft’s latest OS was just recently released and it will be the OS of choice in the next yeas for most PC makers. The initial impressions are quite good and the overall experience should get even better with future Skylake machines. 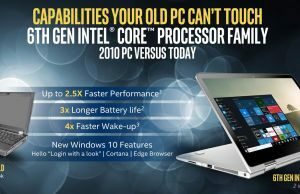 DX12 is perhaps the golden egg of Windows 10, but OEMs also promise a smoother overall performance for a wider range of future laptops running the new MS OS, smarter ways to login (with the help of the RealSense cameras), more advanced data-encryption methods and faster resume from sleep times. To be frank, this is something I’m dying to see in action: a PC that resumes from sleep as fast as a tablet or even as fast as an Apple Macbook. I’d pay for that! On top of that, I should add that the Skylake processors now include an H.265 hardware decoder, something AMD have been bragging with on their Carrizo APUs for a while. H.265 is a video codec created to offer higher quality video at a lower bitrate then the current popular H.264 standard and should take over as 4K video becomes a standard. Previous Intel platforms were unable to deal with H.265 content. The integrated decoder will also have a major impact on HD video playing, regardless of the used format. In other words, Skylake laptops will be able to loop video content for a longer time between charges. 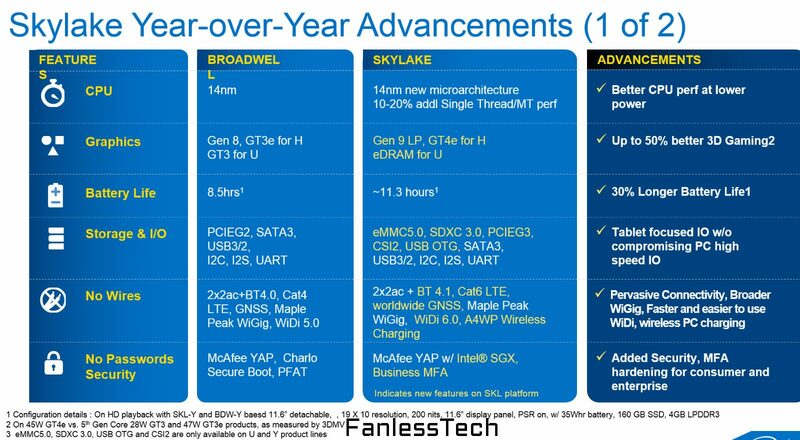 At the end of the day, Intel’s Skylake hardware platform is a major update, probably on a similar scale to Sandy Bridge and Haswell a few yeas ago. Those brought us to the thin and light form factors we have today, while pumping up performance and battery life. 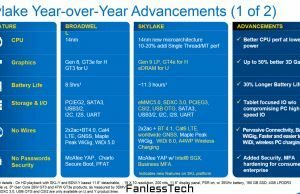 Skylake continuous to improve on these directions, but also brings forward technologies that will probably become ubiquitous in the next years. Now, I’m writing this post in the first days of September 2015, when Skylake was just released and very few products built on this platform have been announced. So if you’re looking for a brand new 2-in-1 or portbale laptop in the second half of 2015, Skylake is going to be an option for you, but don’t rule aside the Broadwell models, which should see significant discounts in the months to come. As we move further away from the launch dates though, you should only focus on Skylake builds. Keep a close eye on our site for updates, check out this list of all the available Skylake ultraportables or this article on the best ultrabooks you could buy these days. Those will help you out in your search for your next computer. And if you have any questions or need any help, just drop me a line in the comments sections, I’m around and will help if I can. There really is no point buying a 5th gen laptop right now and a big reason is direct x 12. I’ll be looking to buy a 6500-6200 for the long battery life. Any one knows if laptop ddr4 will be offered this year? Great article. Thanks. What about Mac and Apple Thunderbolt Display availability? I am looking forward to new Core M devices. I do programming and lightweight gaming (StarCraft 2, Diablo 3) and even the first gen Core M was almost adequate for my upgrade plans (upgrade from Ivy Bridge 3317U). And now Skylake gen for Core M has almost %17 (CPU) + %41 (graphics) performance improvement compared to first gen which will certainly be adequate for me. For example, an updated Asus UX305FA with improved speakers + USB type-C + full HDMI or mini display port (instead of the mini HDMI it currently has) would be a great option. Yes. Look forward to a new ASUS UX305 with Skylake m3/m5/m7 processor. Should also have longer battery. Asus quietly updated their web site to include Skylake version of UX305. The only new thing is the processor. I hope they fixed the speakers at least. Let’s wait and see the reviews. I’m weighing whether to purchase the UX305CA or the UX305FA. The older UX305FA is $145 cheaper. Wondering whether the updated Skylake m3 processor is worth this additional cost. Thoughts? I was interested to read your article on Intel Skylake. You forgot to mention that an implementation of Thunderbolt will require Alpine Ridge to be included and LG 1151 to give enough PCI 3e channels. It is a pity that again Intel failed to include PCI 4 this time. I am aware that the last dots and comma’s have not been added to the specification but enough is completed for an implementation. 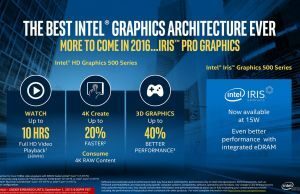 It would be especially significant with the advent of Intel new generation of 3d memory in 2016. Which will require higher speeds than PCI 3 can deliver. I agree that Skylake will see some significant changes in computers including the demise of SATA. 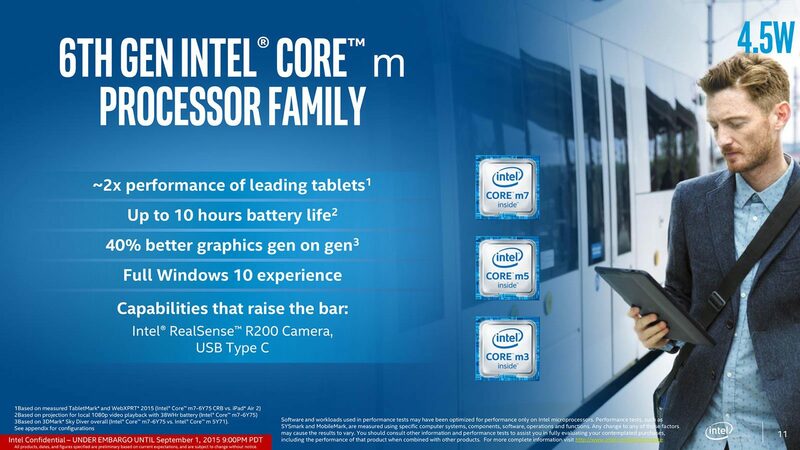 I am not entirely convinced about the number of 2 core as opposed to 4 core processors Intel are introducing. Especially when you bear in mind that the 4 core has virtually double the performance of the 2 core. I assume it was the only way they could get down to 15W. Which cpu is better for performance, speed,gaming purpose intel i7 5500u or i7 6500u or an i5 6200u? If I have to choose between i5 6200u and i7 5500u, then what should I prefer? The i5-6200U is slightly slower in daily use than the i7-5500U, but somewhat faster in games. The i7-6500U is the better of the three, of course. Thank you for putting so much effort into this. Just great. I’ve read this and other posts of yours, as well as replies from you to comments on these posts. They’ve helped me come so far in my own search. At this point I would like to ask you to confirm what I’ve concluded, please. What I need is a laptop for engineering purposes. I will be using on-board software such as Autodesk Fusion 360 and OpenFOAM. I will also be using some cloud-based platforms such as SU2. As such, I understand I need a quadcore processor to max out parallel processing as well as fast DDR4 RAM, lots of that RAM to handle lots of information (16GB or greater), and an SSD drive to streamline data RW between iterations, but not necessarily for long term storage. And I could not care less what graphics card is installed or how posh the display is, as long as it’s not tiny (14″ or greater). Does my analysis so far sound correct? Please do correct me if I’m wrong. Further on, budget is an issue because this thing just might not generate a lot of cash after all, if any. So, what budget laptops (well, relatively) come close to what I should be looking for? And is it risky to go for something “Like New” such as this offering: http://www.amazon.co.uk/gp/offer-listing/B0190DG32G/ref=olp_twister_child?ie=UTF8&mv_size_name=0? Hi. Unfortunately I’m not familiar with any of that software, but I’d reckon it needs powerful hardware, so yes, a quad-core processor and 16 GB of RAM should be what you aim for. If you’re looking to save some, look for slightly older configurations, with a Core i7-4710HQ processor for instance, or maybe a Core i7-5700HQ. You might find these discounted. Also, not sure what “Like New” means on Amazon. There are risk to buying used laptops, and while I don’t totally advise against it, it should only be done by those familiar with such machines and able to tell for sure if they work properly. Even so, electronics aren’t meant to work forever, and there’s no warranty with used computers, so again, a risk. Thanks a lot for taking the time, Andrei. In this case I would be depriving myself of DDR4 RAM, right? What do you think of that in terms of the long-term? This machine would only last me so long; it would be a bridge, not an investment, correct? Lastly, do you plan on writing a guide for selecting SSD’s or recommend a particular one already available online? Check out asus gl552vw-dh71 at amazon. This should fill your needs at low budget. Quite appreciative, Shan. After much searching and thinking the matter over, I decided to go for it, so thank you very much. Thanks for a great write up. Maybe someone can comment on the following two configurations for everyday, Photoshop & CAD use. Price is not an issue in my consideration. Which would be better. Assume all other components to be the same. You’ll fee the benefit of the Intel HD 540 chip in games, but I’m not sure how, or even if, it has any impact in software like premiere and other video editing programs. So overall, for daily use and Photoshop, I’d personally go with the second configuration. Speaking of throttling, have you reviewed any cooling pads on this website? If not, do you personally prefer any particular brand or have set guidelines for picking decent ones?